3D Leafy Camouflage Jungle Hunting Ghillie Bionic Suit Set Woodland Hunting Camo. Unlike traditional ghillie suits, the 3D leaves do not catch onto branches, pick up twigs and stickers. 1 x 3D Leafy Camouflage Jungle Hunting Ghillie Bionic Suit Set Woodland Hunting Camo. Trending at C $30.70eBay determines this price through a machine-learned model of the product's sale prices within the last 90 days. 1/6 Accessories CAMO HUNTING CLOTHING SET Regulated Camouflage Hunter DAM. Ultimate in camouflage clothing. Color: Camouflage. Great for hunting, shooting, wild-fowling, paintball, surveillance, wildlife photography, bird-watching and more. Trending at C $25.38eBay determines this price through a machine-learned model of the product's sale prices within the last 90 days. 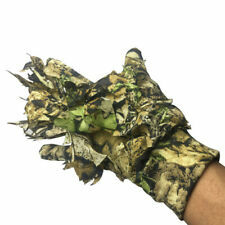 3D Leaf sneaky hunting camo glove. Color – Camouflage. Material: Polyester Fibre. Other country. Size: 80 90cm. Color: Jungle camo. Color: Woodland Camouflage leaf. Pieces: Jacket, pant. Elastic and Drawstring in Pant Waist. high quality suit. Easy Snap Closure on Jacket. Tactical Pants. mask Hood other. Tactical Holster. Tactical Vest. 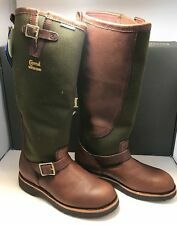 Tactical Boots. Scope Mount & Rail. rail system. Piston & Piston head. Heavy Washed. 3mm Raised Stitch and Flat Stitch on Fabric Patch. Tactical Pants. mask Hood other. Tactical Holster. Tactical Vest. Tactical Boots. Scope Mount & Rail. rail system. Hunting Accessrioes. Is compatible with Viper hood. Made with technology of laser cut. Also can be applied on your weapon or other gear. 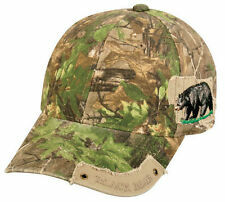 Sitka Youth Hat Forest Pattern. Condition is New with tags. Shipped with USPS First Class Package. Material: PONGEE. Outdoor 3D Leaves Camo Poncho Cloak Stealth Military Woodland CS Suit Clothing. 1 X 3D Leaves Camo Poncho Cloak. (JUST the Leaves Camo Poncho Cloak,NOT included other things). -Free size camouflage poncho, great tool for shooting, monitoring, wildlife photography, and bird watching, etc. 1 x 3D leafy jungle camouflage Hunting Ghillie Bionic Suit Set Woodland Camo Hunting. -The Ultimate in camouflage clothing. Color: Camouflage. -used For hunting, shooting, wildfowling chasing paintball, airsoft, surveillance, wildlife photography, bird watching, etc. Tactical Pants. mask Hood other. Tactical Holster. Tactical Vest. Tactical Boots. Scope Mount & Rail. rail system. Breathing Dustproof Net design for mouth and nose. 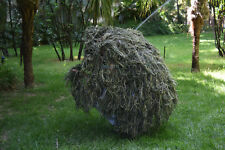 Leaf Ghillie Suit Woodland Camo Camouflage clothing 3D jungle Hunting. Use for Hunting, Shooting, Stalking, Paintball, Airsoft, Surveillance, Wildlife Photography, Birdwatching, etc. Made from tough and durable polyester. Trending at C $23.06eBay determines this price through a machine-learned model of the product's sale prices within the last 90 days. 3D Hunting Camouflage Desert Leaf Ghillie Suit Jacket And Trousers. 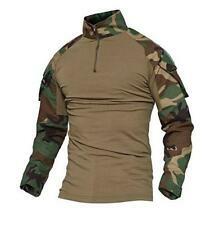 Color: fast Dry Woodland Camouflage netlike cloth. Pieces: Jacket, pant. Specifications: Color: woodland camouflage leaves Material: quick-drying polyester Size: 160cm/63inch * 120cm/47.2inch(L*W) Be invisible in the woods with 3D woodland camouflage leafy design, makes huntinig more easy and funny. 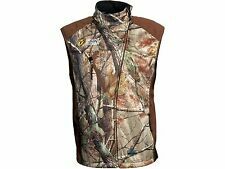 Free size camouflage poncho, great tool for hunting, shooting, monitoring, wildlife photography, and bird watching, etc. Package: 1 x Camouflage Poncho Type Leaves Camouflage Brand Zicac Material Quick-drying polyester UPC 889491181272 Color Woodland camouflage leaves Size 160cm/63inch * 120cm/47.2inch(L*W) SKU BO-WZYF02. Trending at C $38.27eBay determines this price through a machine-learned model of the product's sale prices within the last 90 days. Still in decent condition Absolutely show signs of wear Measurements shown in photos Message me for any reason. From the inventors of the double reed duck call, triple reed duck call, and the YENTZEN Classic. Co-inventor of the Double Reed and Triple Reed Duck Call. Color: Camo. Material: 55% Cotton 45% Polyester. Browning Hunting Suite, perfect condition, used only a few times, silent materia. Condition is Pre-owned. Shipped with USPS Parcel Select Ground. 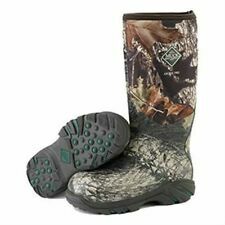 Rocky Snake Boots Waterproof Goretex Hunting Boots Men’s size 10 M 16" Tall. Garahe sale find. Really good treads. Look like they dont uave much use. Please see pictures for overall condition. Ask any questions. Comes in original box. Thanks for looking. Colors: A-TACS FG. Using viper hood allows you to remove the characteristic unmasking contours of the head, the area of the shoulders and forearms. Size: L/XL. U.S MILITARY STYLE D-3A LEATHER GLOVES WITH WOOL INSERTS. HEAVY DUTY WATER REPELLENT LEATHER EXTERIOR WITH ARTICULATED KNUCKLES FOR BETTER FLEXIBILITY. PLASTIC BUCKLE FOR ATTACHING GLOVES TOGETHER. Smith & Wesson. Embroidered Trademark logo on structured front panel. Adjustable velcro backstrap. Level: NIJ IIIA STD 0101.06. Level NIJ III-A STD 0101.06, IIIA rated for the most common pistol caliber threats in the world. AA Shield Soft Body Armor Key Benefits AA Shield Vest Key Benefits This model complies with NIJ Standard-0101.06 for Ballistic Resistance of Body Armor. Hunting is a tradition that dates back to before the United States was a country, and has strong roots to this day. Heading out into the wilderness for one or more days at a time to get a game animal for food or trophy is widely practiced throughout the US. Whether it is the hot, arid conditions associated with the southwest or the freezing, snow-filled terrain of the northeast, having clothes, shoes, and accessories designed for the climate you're hunting in will help keep you protected from the harsh elements. What clothing choices are appropriate for hunting? Camouflage: Camouflage, or camo, patterns help to keep game from spotting you. Camo patterns break up solid shapes to allow you to blend in with other surroundings. These items may have some bright orange or red accents, colours that are hard for animals to see but easy for people to see. 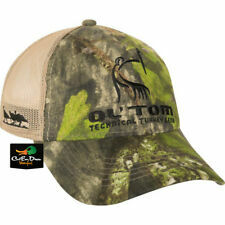 This helps to keep you visible to your hunting partners. Wet and cold: Hunting clothes are available in many levels of warmth to allow you to dress appropriately for what the weather forecast is predicting. Many items are made of polypropylene to wick away or repel sweat, rain, or other moisture. Wet and cold conditions will require such gear, including a heavy jacket, pants, a men's hoodie, and maybe long johns. In warmer conditions, a men's shirt and shorts may suffice. Scent suppression: One of the easiest ways for an animal to detect you while hunting is your scent. To combat this, there are jackets, shirts, and other clothes designed to keep your scent from emanating outward. The material does not breathe very much, however, so be careful to not overdress in temperate conditions. 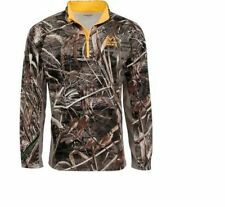 What clothing materials are appropriate for hunting? Different materials provide different levels of protection from the elements. For instance, if you are in a high-temperature area, a camo cotton shirt will work to keep you cool. Wetting a piece of cotton and placing it on your skin will have a cooling effect on your internal temperature. 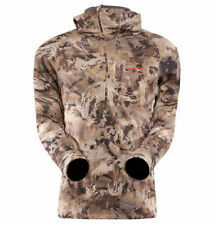 If youre in a snowy forest, some wool camo men's gear will help keep you warm while hunting. Wool absorbs moisture, but it keeps that wetness warm which in turn keeps you warm. Polypropylene is designed for climates that are chilly, but not frigid. It wicks moisture away from the body.